Google has made some changes to its sitelinks to make results more extensive and more prominent than ever before. Even if you're not aware of Google's term "sitelinks", you've almost certainly seen them before. From a search engine optimisation point of view, they're not all that important. You won't see sitelinks if you search for a generic term, like "boilers" or "engines" or "carpet cleaning", but you will see them if you search for a specific company name, like "MTV", "Amazon" or "Microsoft" - where Google is more than 99% sure that it's found the best possible site to match your query, it gives you a miniature index of that site in two columns below the main homepage listing. As of this week, that index has become a lot less miniature. In terms of sheer screen area, the sitelinks section for the Sherpa Van website (see below) has tripled from about 150 pixels in height to around 470 pixels. So it's bigger, but is it better? Well, not really. Again, in this example you'll see that some of the links that have been added are really not what you'd call top-level pages. There are literally hundreds of towns and villages in the Sherpa Van database and for some unknown reason Google has picked out links to three of them: "Shap", "Malham" and "Hethpool". These places are no more important than any of the others and indeed they're far less important than many. 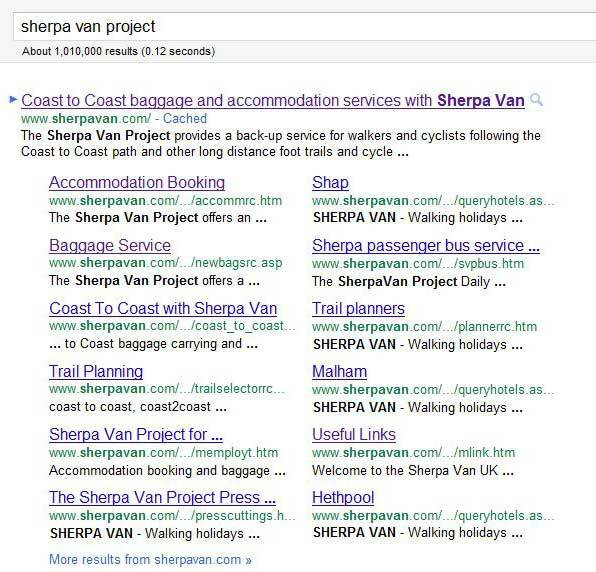 And you get a slightly different set of results if you alter the search terms slightly (for instance, "sherpa van" gets a different set of sitelinks to "the sherpa van project"). Fortunately, Google obviously recognises that some of the automated sitelinks are not going to be very useful, so it's given us the necessary tool to remove or "demote" unwanted links via Webmaster Tools. If you're lucky enough to have people searching for your company or brand name, it's a massive enhancement to your top-of-the-page Google listing. If, like most of us, your customers are more likely to be searching for what you do rather than who you are, then you'll never notice the difference.